YOSHIHIKO NODA, Prime Minister of Japan, said his country would continue sharing lessons learned since the great east Japan earthquake hit his country in March last year. The Fukushima Ministerial Conference on Nuclear Safety, to be held at the end of the year, would provide one such opportunity. Numerous threats endangered human existence, some of which lay in advanced civilization itself and not just in nature. What was needed for the human species to continue to enjoy peace and prosperity? “Humans must get wiser,” he said, and one part of such wisdom was learning to act on behalf of future generations. By way of example, he said many countries had amassed huge fiscal deficits, and if spending was not cut, future generations would be forced to repay them. He also wondered if parliamentary democracy could ensure fairness, as it had no guarantees to represent future interests. The structure invited a type of politics that burdened future generations with deferred problems. “The challenges facing us must be resolved by our generation,” he said. He said Japan had procrastinated in politics for 20 years and was considered a “country that delayed decisions”. He had staked his political career on reforming Japan’s social security and tax systems, by carrying out ambitious policies to maintain a stable financial base and pave the way for fiscal rehabilitation. Citing another “pearl of wisdom”, he said humanity, because it had obtained the perspective of “looking at the Earth from outside”, shared the sublime mission of protecting the environment. At the Rio+20 Summit, Japan had proposed that sustainable growth be explored without the supply-demand crunch of natural resources and energy. Japan would realize a low-carbon and sound material-cycle society and take the lead in solving common energy challenges. 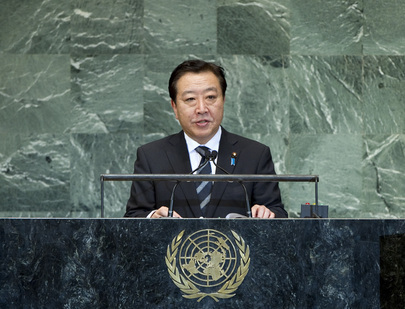 Also, the Japan-led resolution adopted by the General Assembly served to guide development from a human perspective. A third “pearl of wisdom” was the manner in which they settled disputes, although people had failed to resist the temptation to resolve conflicts by force, even in modern times. He pressed the United Nations and the International Atomic Energy Agency (IAEA) to coordinate in urging the Democratic People’s Republic of Korea and Iran to take concrete actions vis-à-vis their nuclear and missile issues. Also, abductions by the Democratic People’s Republic of Korea also violated basic human rights and Japan was committed to do its utmost to realize the return of all victims through strengthened coordination with Member States. It would work to resolve outstanding issues, settle “the unfortunate past” and normalize relations, in line with the Japan-DPRK Pyongyang Declaration. He urged the Democratic People’s Republic of Korea to take positive steps. The representative of Japan, responding to the statement by China’s Minister for Foreign Affairs, said his Prime Minister had stated that various issues of international society must be solved by reason rather than by force. Underscoring the importance of the rule of law, he said any attempt to realize an ideology or claim by the unilateral use of force or threat of force would be in violation of the spirit of the Charter. The Senkaku Islands were clearly inherent to Japan, he said, recalling that in January 1895, a Cabinet-level decision had been made to incorporate them, while Formosa (Taiwan) and its associated islands had been ceded to Japan in line with the Treaty of Shimonoseki, signed in April that year. The assertion that Japan had taken the islands from China could not logically stand, he said, adding that his country had conducted surveys of the islands since 1899, and they had shown no trace of having been inhabited by China or under Chinese control. He said Japan had renounced its territorial claim over Formosa, and China had ceded the Pescadores Islands after the Sino-Japanese war, in accordance with article 2(b) of the San Francisco Peace Treaty, which made it clear that the Senkaku Islands were not included. Only since the 1970s had the Government of China and the Taiwanese authorities begun making territorial assertions about them. Taking the floor again, the representative of Japan said there was no doubt that the Senkaku Islands were under his country’s valid control. China’s assertions had no value, and there was no issue of territorial integrity, he said, adding that Japan’s position remained the same.